Mazda 6 Forums : Mazda 6 Forum / Mazda Atenza Forum > Mazda6 (Atenza) > Mazda6 (Atenza) > 1st-Gen > Stop Whining! A case study of front-end bearing noise. View Poll Results: What is causing front end high-pitched whine? Stop Whining! A case study of front-end bearing noise. So for something new, I have decided to try and crowdsource my next diagnostic adventure. In the never ending quest to keep my old mk.1 wagon, not just alive but thriving, I have a new challenge. Chief Complaint (CC): A high pitched sound coming from the front end that I can hear on the highway when driving on a section of 1st word tarmac. It sounds like a bearing. Subjective (S): when driving at speeds higher than 55mph on a section of smooth new road there is a very faint whine coming from the front end. The sound is significantly louder if I drive faster 70-80mph. The sound intensity increases if I accelerate and immediately reduces (does not completely go away) when lifting throttle. There is no change in sound intensity between "off-throttle" and "neutral" when at speed. It should be noted that the car will also slightly pull to the right when accelerating (5th gear) and then pull to the left when coasting. If I manually shift to 4th gear the sound will be louder (no change in pitch) when accelerating than it was in 5th gear (at the same speed). The pulling effect seems unchanged. I have not noticed any shaking or vibration connected with the sound. There is no change with engine RPM, only road speed. I can feel slight play in my steering column splines (need new lube) but that is unrelated IMO as I can identify a distinct difference in feel and sound. Passenger outer CV boot split (only noticed when separating each boot billow) no grease slinging detected. Passenger Inner "half-shaft" play not checked. Slight rotational play noted in telescoping splines of steering column with rotation. Okay, if you made it to the bottom I sincerely thank you. This (presented in a manner that is easy for me) is what I know/can remember to this point. I have a plan on what I will likely do next but I will leave that out for know as I hope to glean some of the communities unbiased wisdom. I am also adding a poll (multiple choices permitted if you think there is more than one problem) with the most likely culprits (from my opinion) that you all can submit if you like. TL;DR Recent high-pitched whining sound from vehicle front end that is heard on quiet road at 55+mph and gets louder when accelerating. No change in pitch with varying engine RPM. What do you think it is? After replacing the carrier bearing (G569-25-155), CV axle (GP22-25-50XR-0B), and Wheel Bearing (GP7A-33-047), the faint whining heard when accelerating and unchanged by direction remained. My conclusion is that the faint bearing sound that I heard is internal to the transmission. Perhaps pinion bearings or possibly just gear noise. I plan on doing nothing unless the noise gets worse or new symptoms present. I won't vote yet, I'd like more info before doing so. 1. The fact that acceleration/deceleration affects the direction of the vehicle and since you are hearing a metal to metal sound when going over a bump, I believe you have a bad control arm bushing. Yes, you replaced them 10k miles ago but did you buy OEM or aftermarket? I always had bad experiences with aftermarket rubber parts, I now always buy OEM. MOOG and BECK/ARNLEY control arms didn't last a year on a Sienna I had. 2. Does the wine increase/decrease when you do sharp turns at high speed? This will help determine if the whine is coming from a wheel, transmission or carrier bearing. Great, thanks for even considering it. And also thanks to @bluedevil6 and @michael95350 for casting a vote. 1. The fact that acceleration/deceleration affects the direction of the vehicle and since you are hearing a metal to metal sound when going over a bump, I believe you have a bad control arm bushing. Yes, you replaced them 10k miles ago but did you buy OEM or aftermarket? Doing sharp turns at 70+ mph tends to alarm other motorists...funny how that is, despite the machine being able to easily comply. I did a few snap lane changes and did not notice any change in pitch. This is fairly challenging because they way the car is set-up I am in the next lane (or more) in a second and that leaves very little time to pick up a change in pitch. My best guess is no change in pitch with turning. I will try and visit a section of highway late where I can make a big fast lazy ess or two. So, because you described the noise as a whine and not as a wot, wot, wot or rumble, I believe it is your transmission, although I strongly hope it is not. A whine usually comes from a well lubricated worn bearing, a dry worn bearing such as the wheel and half shaft would will make a different type of noise. I still believe you have something lose, not related to the whine. I suggest you check your control arms (again) and your engine mounts. jman might be on to something though too, when I replaced my rear shocks I had an odd clicking sound every time I hit the slightest bump long story short I spent weeks trying to figure it out and it was the bottom shock mount it was torqued to spec but for some reason that wasn’t enough to squeeze the bushing on the new shock it must have been about a millimeter smaller than the previous one so it was able to twist ever so slightly when the load would change. My point being that your metallic noise could be from something very small so make sure you take your time when examining the suspension. @jman1200 if he has a worn bearing in his transmission wouldn’t he notice an abnormal amount of metal on the magnetic drain plug when he changes the fluid? Last edited by bluedevil6; 12-06-2018 at 09:44 AM. Not noticeable if it is normal wear. There will always be minor traces of metal in the oil, parts wear over time regardless of how much you take care of them. Only massive failures will leave chunks of metal. Again, I hope I am wrong. That does make sense, @DrFeelGood how many miles are currently on the wagon (my apologies if I missed this in another post)? Also just saw the video that’s A LOT of play are you positive all of that play is in the rack itself? I know you said you have replaced everything but it is possible to get bad parts, I’ve had my fair share of them. The symptoms you describe are consistent with inner tie rod failure. Last edited by bluedevil6; 12-06-2018 at 11:27 AM. I just got a chance to look at this video. This will explain why your vehicle pulls to a side when accelerating so disregard what I said about the control arms. 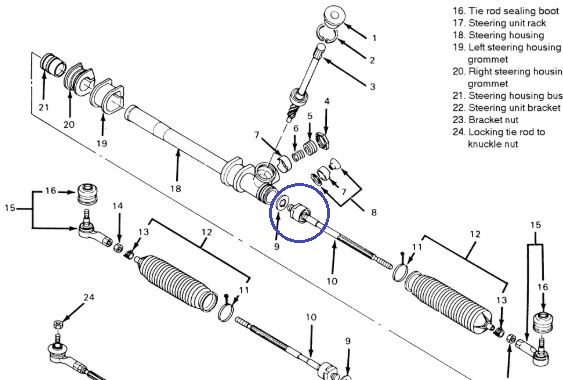 I strongly believe the component circled in the diagram is worn (inner tie rod). It happened to me many years ago on a Mazda 323 I used to own, I took the suspension apart 3 times looking for the clunking noise and it ended being that. Not sure if you can get it without buying the whole rack (it was available for mine). That part is covered by the dust cover rubber thingy. There are two, one for each side. My opinion is the pinion bearings inside the transmission as well as other bearings are just showing their age. My car has a very slight whine that only I notice, same symptoms as yours. It is a function of age and mileage, not much can be done other than R&R. If you can hear the noise over the radio then you have problems ASAP. If it is still very subtle and only you seem to hear it then you have time. I plan on sourcing a used transmission for my car this winter/spring and have it R&R'd and keep it on the shelf until it's needed. There should be 0 play in the steering as well as 0 noise. I would pull the inner tie rod boots and give them a close look. Same with the rack bushings, see if they are still intact. If the rack itself has any play anywhere then it needs to be changed ASAP. Check the sway bar bushings/end links real close too. Those are the things that usually make all the noises. In my opinion, these cars have brutal torque steer, especially at WOT and anywhere over 4K RPM in 1st/2nd/3rd. I have to hold on with both hands when I start driving spirited.